If your tooth is infected, we can perform a Costa Mesa root canal to remove the infection and save the tooth. At our dental office, we focus on both preventative care and cosmetic dentistry. This uniquely positions us to perform procedures like root canals because the process involves restoring both the health and appearance of the tooth. Our goal is to complete it in such a way as to give you a fully functioning tooth that also looks like it was never infected. When you visit our office, we will begin by examining your teeth and gums. If it appears that your tooth is infected we may take x-rays to determine how deep the infection goes and what areas of the tooth are infected. This is helpful when deciding whether or not the root of the tooth needs to be removed. 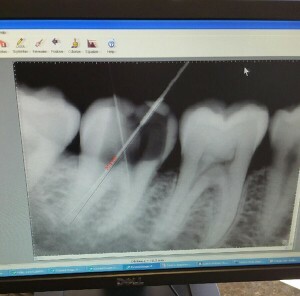 Next, we will numb the area with anesthesia so that you do not feel anything during the procedure. While there is a rumor that root canals hurt, the truth is that you will feel nothing other than slight pressure. Any discomfort that you felt prior to having the infection removed will far surpass anything that you experience while we are removing it. We are experts at gentle dentistry and can assure you that your experience will be a positive one. Once you are sufficiently numb, we will create a small hole in your tooth so that we can remove the infected area. A Costa Mesa root canal is typically required because the dental pulp has become infected. This is the soft center of the tooth so the only way to access it is by creating a hole first. At times, the roots can remain in place where in some circumstances they must be removed as well. Once done, we will clean the area and seal the hole with a rubbery substance. While losing the root of your tooth may sound like a big deal, it’s really not. Your tooth needs the root to grow but once it is fully mature, your tooth can function without it. Depending on the extent of the infection and the amount of enamel that was removed, we might need to further restore it with a filling or a dental crown. Both can be natural-colored so that your tooth looks as though it was never damaged in the first place. When considering where you would like to go for a Costa Mesa root canal, this is one of the primary benefits of visiting our office. Regardless of the level of restoration that you need, we can make sure that it blends in with your surrounding teeth so that you can continue using your tooth like normal and never know which tooth was infected in the first place. One thing to keep in mind is that you should visit us at the first sign of a toothache because the sooner we can remove the infection – the better.